DreamLight Constellation 2.3.0 – Cross-platform LightWave 3D Network Render Controller for Both Mac OS X & Windows! DreamLight® Constellation™ is a network render controller for LightWave 3D’s network rendering system – ScreamerNet. LightWave 3D Layout includes a basic built-in Render-Q and basic Network Render panel but using them ties up LightWave Layout. Using DreamLight Constellation to manage your background and network ScreamerNet rendering instead frees LightWave 3D so that you may continue working in Layout while rendering. DreamLight Constellation also includes many features beyond what’s available in LightWave’s built-in Network Render controller or Render-Q, including the ability to remap file paths for local/remote and Mac/Win render nodes. (Render nodes are instances of LWSN, normally one per computer.) The dynamic drag-and-drop scene render queue may be reordered and scenes may be added or removed at any time while the network continues to render. Scene settings may also be overridden when scenes are added to the Scene Queue. Previously rendered frames are automatically detected allowing an easy way to render missing frames. DreamLight Constellation may be used as a replacement for LightWave Layout’s built-in Network Render Panel and/or Render-Q. The FREE LITE version of DreamLight Constellation may be used for single-computer batch rendering. Additional network render nodes (computers) may be enabled by simply purchasing a registered license key later. The DreamLight Constellation download bundle includes DLI_SNUB-Launcher for a complete LightWave 3D network rendering solution. Licenses are available for both standalone DreamLight Constellation or bundled with the companion DLI_SNUB-Launcher. 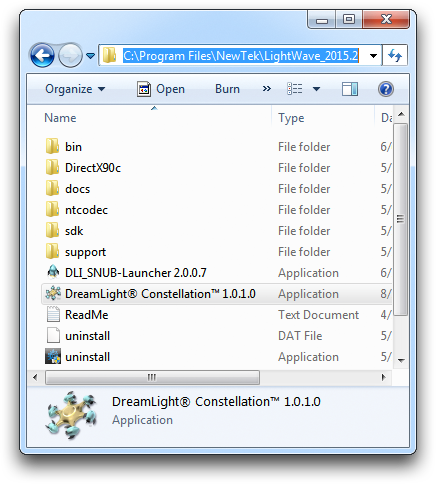 Download the FREE LITE version of DreamLight Constellation bundled with DLI_SNUB-Launcher today! NewTek based the Mac OS X section of the Distributed Rendering chapter in the LightWave 9 – LightWave 3D 2015 manuals on our Mastering LightWave 3D ScreamerNet LWSN white paper. DreamLight Constellation and DLI_SNUB-Launcher are both compatible with LightWave 3D 2018 & 2019. LightWave 3D 2018 & 2019 still include the LWSN ScreamerNet render node module so DreamLight Constellation and DLI_SNUB-Launcher continue to work with LightWave 3D 2018 & 2019 using LWSN just as in previous versions. DreamLight Constellation and DLI_SNUB-Launcher do not yet support LightWave 3D 2018 & 2019’s newer network render daemons, they continue to use LightWave 3D 2018 & 2019’s included LWSN. LightWave 3D 2018 & 2019 version scenes are recognized and may be rendered with DreamLight Constellation. LightWave 3D 2018 & 2019 scenes will render and save fine as long as the buffer saving settings are set up properly within the scene file directly in LightWave 3D 2018 & 2019 before adding the scene to DreamLight Constellation. DreamLight Constellation will disable its advanced feature that normally allows you to override the RGB scene settings at the time they are added to the render queue. The buffer saving information is just passed through to LightWave 3D 2018 & 2019’s LWSN and will render and save fine as long as you have set everything up properly in LightWave 3D 2018 & 2019 before adding the scene to the DreamLight Constellation render queue. Cross-platform drag-and-drop-dead-easy LWSN for both Mac OS X and Windows! DreamLight Constellation is a really fantastic Lightwave Screamernet controller. It’s also really great to have one that works so well on Mac OS X. It’s fast and very easy to set up, and – most crucially – seems very reliable, even over my less-than-perfect office ethernet connections. I can’t recommend it highly enough. It’s very reasonably priced too, so you have no excuse now not to set up your own mini (or not so mini!) render farm. Cross Platform network rendering has never been easier with DreamLight Constellation/DLI-SNUB-Launcher! When setting up complex scenes to render I count on DreamLight’s render tools to not get in the way especially when it’s 3am and all I want to do is press the render button. I am pleased to recommend DreamLight Constellation for LightWave network rendering management. I found it easy to set up and Mike’s support is great! Amazingly simple to setup and configure! Does what it is suppose to do, awesome addition to my work flow. The FREE LITE license version of DreamLight Constellation is fully functional for batch rendering, with the following limitations. All custom settings may be used, but are not saved between launches. It is also limited to ONE ScreamerNet render node (computer). The standard (STD) registered license for DreamLight Constellation enables fully functional saving of all custom settings between launches. The only limitation of the standard license is that it is limited to FIVE ScreamerNet LWSN render nodes (computers) at a single site. The professional (PRO) registered license for DreamLight Constellation enables fully functional saving of all custom settings between launches. The only limitation of the professional license is that it is limited to 10 ScreamerNet LWSN render nodes (computers) at a single site. The enterprise (ENT) registered license of DreamLight Constellation enables fully functional saving of all custom settings between launches and may also be used to manage a virtually unlimited number of ScreamerNet LWSN render nodes (computers) for network rendering at a single site. It’s technically limited to 999999 nodes, which enables as many nodes as possible up to any practical limit of LightWave or your network. Before ordering a registered license, please first download, install and test DreamLight Constellation to verify that it works as desired for your particular installation. The FREE LITE version is fully functional other than it is limited to one render node (computer) and saving custom settings between launches is disabled. Even though the FREE LITE version is limited to one node at a time you may still test it with all three types of nodes, local, remote and cross-platform, individually one at a time. Once you verify that it works as desired for your installation then feel free to order a registered license and a registration license key will be emailed to you that you may copy/paste into the registration panel to unlock the purchased level of additional nodes & saving custom settings. NOTE: Please be sure to include your correct e-mail address when you place your order. We will e-mail you the registered user name and license key that you will need to enter in the registration panel. Orders are processed manually, typically within 1-2 business days, Monday-Friday. If you do not receive a registration e-mail within a few days please check your spam filters. Please download and test all software BEFORE ordering a registered license. Download DreamLight Constellation (download includes DLI_SNUB-Launcher) by clicking or right clicking on the link below and selecting Save Link As… from the pop-up menu. After downloading the DreamLight Constellation.zip file, unzip the file by double-clicking it on Mac OS X or by right-clicking on it and selecting Extract All… Also unzip any zipped folders within. Do not run the program from within the zipped archive. 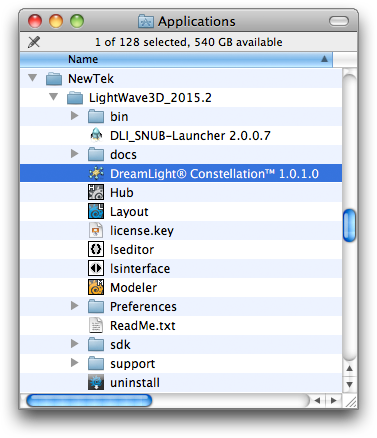 If you ever wish to uninstall the apps, simply drag the DreamLight Constellation and/or DLI_SNUB-Launcher application file(s) to the trash. Now that DreamLight Constellation is installed proceed to the Quick Start Tutorials to learn how to use it to render. For additional information about DLI_SNUB-Launcher please see the DLI_SNUB-Launcher manual. Please report any issues, problems or bugs through our Contact Form. Thank you! Redesigned the scene queue implementation to optimize allocation and loading of still frame scenes. It was previously only optimized for animation scenes, causing still frame scenes to be loaded by more render nodes than necessary. Scenes are now only loaded by as many nodes as necessary. The scene queue only used to track one scene at a time designated as the current scene to render. Now it tracks as many currently rendering scenes as necessary based on the number of frames to render and the number of available render nodes. Fixed a bug that could sometimes cause the multiple scene loading to fail to reopen the scene drawer if return was hit too quickly when loading multiple scenes. If return was hit before the drawer was completely open it could get out of sync and fail to reopen on the next scene. Grayed out the OK/Cancel buttons until the scene drawer finishes opening to prevent this. Fixed a bug where rapidly hitting return multiple times while the scene drawer was closing could add the same scene multiple times. Implemented a flag to only allow first return to trigger the OK button. Fixed a bug that sometimes prevented remote and cross-platform path remapping from working properly. Fixed a bug that sometimes prevented scene override settings from working properly. Fixed a bug that sometimes prevented multiple scene loading from working properly. Fixed a bug that failed to verify content folders without an Objects folder. Updated the Mac build to version 2.2.1 (2.2.0 was in the old zip archive). Updated the zip package to 2.2.1b to differentiate it from the previous zip archive. Fixed a bug that sometimes prevented proper reinitialization of selected render node. Improved robustness of reinitialization process. Improved handling of aborting renders in process if node was launched with the -t Time Check option to look for ‘abort’ commands. Improved node queue to continue reporting node status for paused nodes and only pausing scene loading and rendering new frames. Fixed a bug that prevented the add scene dialog from closing when the OK button was pressed when adding LightWave 2018 scenes or scenes without a Save RGB path. Fixed a minor bug that prevented DreamLight Constellation from launching on Windows if LightWave 3D Layout was not found on the computer so the default Content Folder could not be found from the Layout config file. Now launches anyway and just defaults to the user’s Documents folder for the Content Folder and other defaults. Fixed a minor bug that prevented DreamLight Constellation from locating the proper version of LightWave Layout and Layout’s config file when Constellation is run from the same folder as LightWave if multiple versions of LightWave were installed. That now works as intended on Mac OS X where it will look for a Preferences folder inside the current Constellation folder if Layout is also in that folder. If no Preferences folder is located there it will look for the matching version of the config in the Application Support folder. On Windows Electron currently can’t locate the original application folder for a standalone portable application. It uses a temp directory which doesn’t help Constellation locate LightWave Layout, so on Windows the default locations of LightWave Layout is searched regardless of where Constellation is launched from. This only affects the defaults to read from the LightWave Layout config file. It does not affect anything the user explicitly sets. Fixed some other preferences loading/saving issues on both platforms. Added MD5 Hash along with a link for users to verify the integrity of the download if desired. The check to remove trailing slashes from some default paths that was added in 2.1.1 could fail on systems where the LightWave Layout Config file could not be found. This could prevent Constellation from fully launching and opening the window. In such cases quit the Constellation process using the task manager or activity monitor and update to this new 2.1.2 version which has additional error checking for a missing LightWave Layout config file. Added new setting to Render Missing Frames Only in the load scene drawer. Now warns when adding scenes if frames are already rendered allowing user to re-render all frames or only render missing frames. This makes it easy to render any missing frames by simply re-queuing a scene to render. In addition to single frame range now added support for arbitrary frame ranges as well. Added frame X of total frames information to the scene statistics in the scene queue. Cleaned up a few minor inconsistencies in the GUI. Added check to remove trailing slashes from default paths read from the LightWave 3D Layout config file on first run. LightWave handles paths inconsistently in the config file where some may have a trailing slash and others may not. This was causing problems in some cases if the content folder path was saved with a trailing slash and read by Constellation the first time it was run. Rewrote the entire LWSN communications stack for more robust node communication. Rewrote cross-platform path remapping for more robust cross-platform network rendering on Mac OS X & Windows. Implemented user adjustable ScreamerNet Throttle to allow user optimization of network. This brings the Windows version on par with the Mac version for robustness and speed. Implemented fully resizable and dividable window with full native OS support for fullscreen mode and saving/reloading window settings. Implemented full native OS notification manager support for scene rendering finished notifications. Implemented full native OS support of taskbar/dock progress and notification badges. Fixed a bug where the OK button would fail to dismiss the Scene Settings panel on Windows. This was caused by the Content Folder and Remap Fields being set to blanks if LightWave 3D had never been run on that Windows PC so there was no existing config file when Constellation was run. This failed to set the default Content Folder and Remap Fields and confused Constellation when it attempted to create the hidden temp scene files with remapped file paths. Added new error warning the first time a cross-platform render node is detected if the Remap Folder or Remap to Cross-platform Path setting is disabled and warns the user to set those settings. Fixed a bug where the remote or cross-platform remapped path could be used to load a scene when the local path should have been used instead. If the Remap Folder was disabled after setting a Remap to Remote Path or a Remap to Cross-platform Path had been enabled Constellation would continue to use the remapped paths. Fixed. Updated all pages of DreamLight Constellation, DLI_SNUB-Launcher and Mastering LightWave 3D ScreamerNet LWSN white paper to reflect adjustments to FREE Lite node limit change to 1 node. Also updated all pages for SEO. Fixed bug where disabled menus were not re-enabled. Fixed preferences field tab order. Updated tooltips to reflect registration level changes & new preferences settings. Added new Preferences setting for Remap Folder to separate the Content Folder from the Folder Remapping features. So now you can remap the Content Folder if desired by using the same path or use a separate folder path for remapping. This enables use of multiple Content Folders used within a common mount point. Added 3D animated Constellation icon/logo to indicate Node Queue scanning/processing. Updated About Box information and links. Fixed a bug that prevented links from working. Added feature to store a Content Folder with each loaded scene enabling auto Content Folder switching when scenes are sent for rendering. Updated Help Menu items for Mastering LightWave 3D ScreamerNet LWSN white paper update. Disabled left/right arrows to prevent moving to other cards. Fixed bug that prevented drag-and-dropping scenes on app icon as a droplet. Fixed bug with small empty tooltips on some text labels. Added ability to read default Command Folder from LightWave Config file. Fixed bug where temp scene indexes were failing to increment. Fixed bug where Windows temp scenes were not hidden. Fixed bug where Windows path remapping setting was not reloaded in preferences panel. Changed slashes to backslashes for paths on Windows. Slashes worked in LWSN on Win but could be confusing for the user, so changed to backslashes to avoid any user confusion. Added 30 second heartbeat delay on Windows or when activating Windows remapping on Mac as a workaround for a Mac to Windows networking issue where LWSN reads old commands out of the SMB network cache rather than reading the actual commands written in the job file by Constellation. Further Windows SMB networking optimization will be added in future builds. Quick fix for Mac version not finding LightWave config file when run in LightWave folder. Posted initial version release online as open beta. Always verify that you have the latest build of DreamLight Constellation and/or DLI_SNUB-Launcher based on the version numbers. Download and install the latest version if you’re running an older version and retest any issues with the latest version. We often fix any bugs we find or that are reported by users and post new builds with fixes as soon as possible. You may also review the Version History to see if a fix for any issue you may have encountered is reported as fixed. If rendering results in black frames that often means the Content Folder is set incorrectly or being incorrectly remapped. LightWave 3D ScreamerNet requires content to be in a properly structured Content Folder according to very specific rules. If you are having problems getting your own scenes to render across the network please verify that you have a properly structured Content Folder. If running into trouble using DreamLight Constellation with your own content, please try using the included DLI_SuperBalls content with the quick-start tutorials to eliminate any possible custom content issues. LWSN can drop frames for various reasons such as LWSN crashing, hanging, running out of RAM/HD swap space or dropping connection to a remote network share (see below). If DreamLight Constellation appears to be stalling in various places constantly and seemingly randomly, verify that you are not accidentally running two instances of Constellation or LWSN on the same computer. This is more easily accidentally done on Windows where double-clicking on the icon can launch additional instances of the program rather than just bringing the already running instance forward. It can also happen on Mac OS X if you have multiple versions installed and accidentally launch a different version while one is already running. If more than one network controller is running at once or more than one LWSN instance has the same node number they will both be attempting to communicate through the same Command Folder and will confuse each other. So verify that only one Network Controller is running at a time and all LWSN render node instances have separate node numbers if you experience stalling or erratic LWSN behavior. You may also try increasing the ScreamerNet Throttle in the preferences which will slow down the communication with the nodes in case you’re having a network file cache issue that may be confusing the LWSN nodes. When using Mac to Windows SMB filesharing the operating systems use file caching that sometimes interferes with LWSN reading commands from the job files. Sometimes Windows nodes will read old commands out of the SMB network cache rather than the actual commands that are written in the job files. When this happens LWSN will repeat commands or report that it is “Ignoring duplicate command.” and get stuck. If that happens just reinitialize the node and it will resync. To minimize this issue we’ve added a setting called the ScreamerNet Throttle in the preferences. You may use that to set a number of seconds to delay between reading commands from the ack files. You may increase this setting until LWSN stops reporting “ignoring duplicate command” errors. If you are having difficulty setting up the Shared Folder and Remap paths when running Constellation on Windows you may simply mount the Content Folder on the host using the same network path as you do on the remote nodes. Set Constellation and all local/remote nodes to use that network path for everything instead of the local path. Then turn off the Remote Remap settings and turn off the Remote checkmark for all nodes. Then Constellation and all nodes, local and remote, will all use the same network path and remote remapping is no longer necessary. If pressing the OK Button when adding scenes does not close the scene panel in DreamLight Constellation version 1 then go to the Preferences window and enter any folder into the Remap Folder field and then turn it off. There’s currently a minor bug in version 1 where if this field is blank it can prevent the scene panel from closing, even if it is not being used. It’s inadvertently being checked even though it’s off and shouldn’t be. In DreamLight Constellation version 2.0 try retyping the Arbitrary Frame Range or resetting some other setting on that panel. Sometimes if nothing on the panel changes it may get stuck and the OK button fails to close the panel. You can also try setting DreamLight Constellation’s content folder to something other than the one used for the scene you’re trying to load. Then when DreamLight Constellation asks if you’d like to change to the content folder detected in the scene, say Yes. Version 2.2.1 should fix these issues. Please let us know if you still see this problem on version 2.2.1+. If having problems launching DreamLight Constellation try deleting (or temporarily renaming) the config files. When Constellation is first launched it locates the LightWave 3D Layout config file if possible to read some default paths. It then reads any existing DreamLight Constellation config.json file and finally creates or updates that file. So deleting or renaming the LightWave 3D Layout config and/or the DreamLight Constellation config.json file can sometimes fix launching problems. We will fix any bugs that are found within DreamLight Constellation and/or DLI_SNUB-Launcher in subsequent updates when possible. We are unable to fix any bugs in LightWave 3D ScreamerNet LWSN itself of course. For those you’d need to contact NewTek. If you think you’ve found a bug in DreamLight Constellation and/or DLI_SNUB-Launcher please try to render the scene directly in LightWave 3D ScreamerNet LWSN alone using LightWave’s built-in network render panel. That’s the best way to rule out any LightWave 3D ScreamerNet LWSN bugs. Please report any DreamLight Constellation issues or bugs through our Contact Form. While we can’t troubleshoot your custom setup, we can often point you in the right direction. We respond to email support inquiries for registered users as soon as possible. We do not offer telephone tech support, so no tech support phone calls please. TM & (C) Copyright 1987-2017 DreamLight Incorporated. All Rights Reserved. DreamLight® Constellation™ is exclusively intended for use by the original purchaser and is non transferable. By downloading DreamLight Constellation you are agreeing to these restrictions. 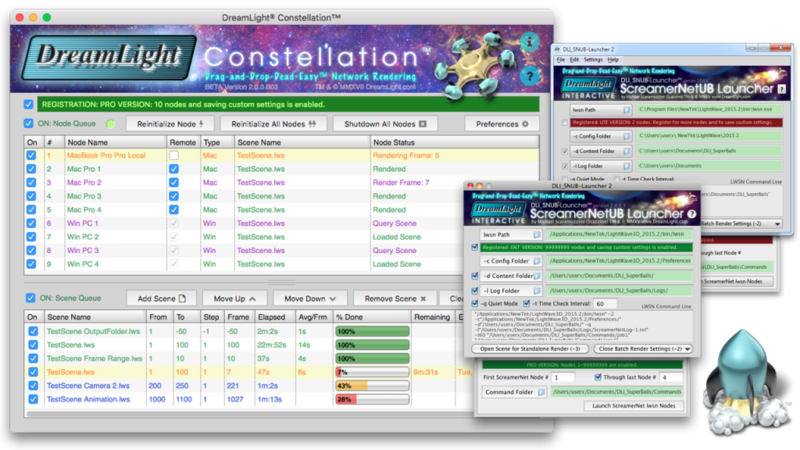 DreamLight Constellation is a commercial utility. It is not in the public domain. It remains the property of DreamLight Incorporated. It may not be distributed, redistributed, posted for downloads, sold, used as an inducement to purchase any other items, bundled with any other items or altered in any way without the express written consent of DreamLight Incorporated. DreamLight Constellation & DLI_SNUB-Launcher are licensed to a user for a single site (physical location). A separate STD, PRO or ENT license is required for each additional site that it may be used at. It may be used on the licensed number of computers (5 computers for STD version, 10 computers for PRO version or unlimited  computers for ENT version, up to the LightWave or network limit) at a single site. Use at additional sites requires additional licenses, one license per site. Please download and test the software to your satisfaction BEFORE ordering a registration license key. DreamLight Constellation & DLI_SNUB-Launcher are provided as-is. Use at your own risk. DreamLight makes no warranties whatsoever regarding these items or their use in any way. DreamLight’s liability is limited exclusively to a refund of your DreamLight Constellation & DLI_SNUB-Launcher license fees, if any. Only these terms govern this agreement. Any terms on PO’s, etc. shall be considered null and void. If any term or condition is ruled to be invalid, the remaining terms & conditions shall remain in full force. This agreement shall be governed by the laws of the state of Massachusetts, USA. DreamLight and the DreamLight logo are registered trademarks of DreamLight Incorporated. DreamLight Constellation, the DreamLight Constellation icon/logo, DLI_SNUB-Launcher, the DLI_SNUB-Launcher icon/logo and drag-and-drop-dead-easy are trademarks of DreamLight Incorporated. LightWave is a registered trademark and ScreamerNet is a trademark of NewTek Inc. Windows is a trademark of Microsoft. Macintosh, XCode, Aqua, Mac OS X, Mac and the Mac logo are trademarks of Apple, Inc., registered in the U.S., and other countries. If you find DreamLight Constellation, DLI SNUB Launcher or our Mastering LightWave 3D ScreamerNet LWSN white paper and tutorials useful, please support our continuing efforts by registering DreamLight Constellation or registering DLI_SNUB-Launcher, by purchasing our Award-winning 3D CGI Short Film – BlastOff!™ Special Edition DVD, by purchasing some of our BlastOff! Merchandise or award-winning DLI SNUB Launcher logo merchandise or by buying our book: Creating a 3D Animated CGI Short.